PROSPER is about bringing the community together to do something for youth and families, but it's not just about doing something, it's about doing something that has been proven to work. PROSPER provides evidence-based solutions to prevent risky behaviors among youth, to support their healthy development and strengthen their families. The PROSPER approach is for all types of youth and families, not just for those who may need more help. We think that all families can become a little stronger and youth can always use more support to help them make healthy choices in a world that is full of negative influences and pressures. PROSPER maximizes the impact of donations by helping schools and communities use programs that work and that stand the test of time. PROSPER also maximizes donations by reducing the costs of delivering these programs. In fact, costs for implementing one of the family programs on the PROSPER menu are reduced from 59 to 67% over costs of using the same program without the PROSPER System. Most importantly, when youth and families are doing well and staying out of trouble, communities benefit by having a strong workforce and upstanding citizens, society benefits by having fewer individuals incarcerated or needing substance abuse treatment, and future generations benefit from having well-adjusted role models to influence them. Consider a donation today, because when youth PROSPER, we all do! Watch the video to learn how your investment helps kids, families, and communities. Your gift can help fund programs for a young person in your family or someone who lives in your neighborhood. These programs have been scientifically proven to benefit all youth. When all youth benefit, the community as a whole benefits. 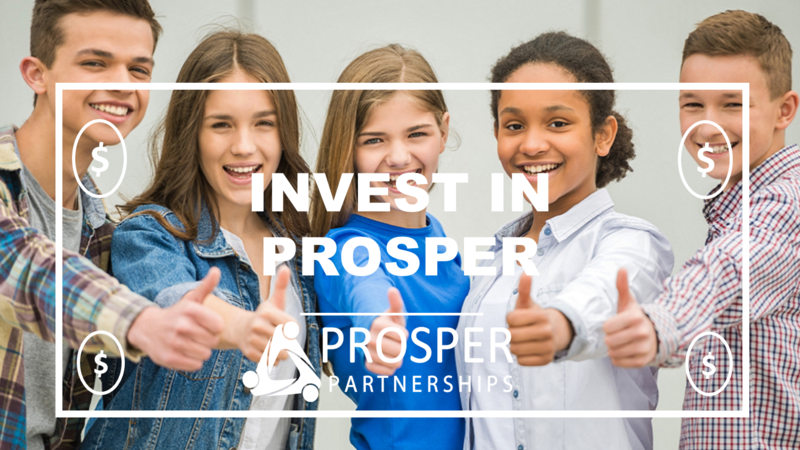 The PROSPER Delivery System has been shown to be a cost efficient and effective way to make a difference for youth and families, so you can feel good about every dollar you invest!